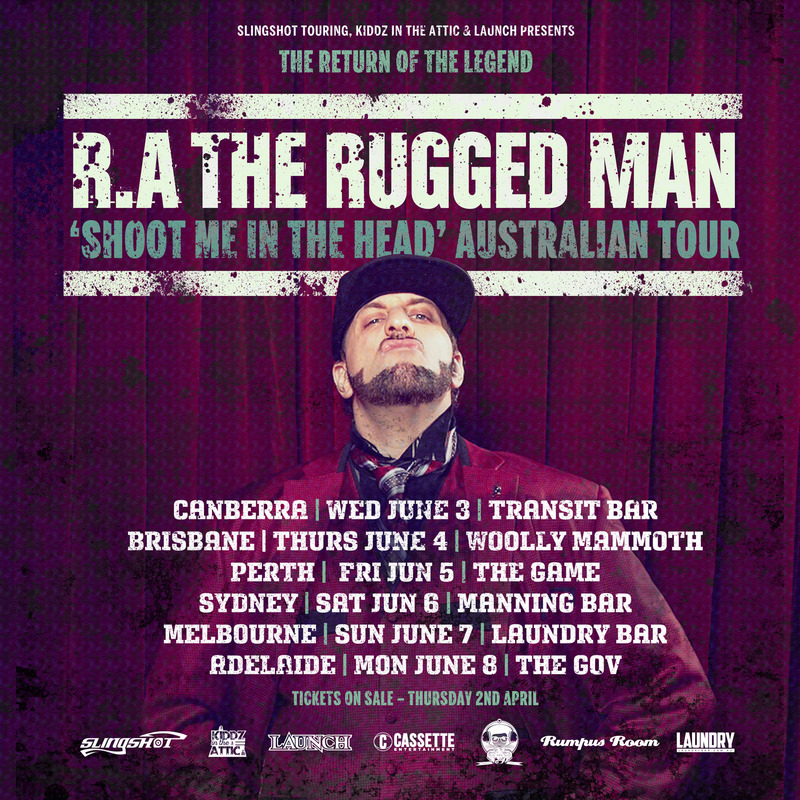 The legendary rapper R.A The Rugged Man will be back in Australia for a national tour ‘Shoot Me In The Head’ starting June 2015. An emcee who needs no introduction, R.A is as controversial as he is influential. Hailing from New York, he flawlessly combines the authenticity of his undeniably rugged life with his undisputed mic skills and understanding of the genre as a hip-hop historian. R.A. pioneered the truly independent indie-rap hustle, pressing his own vinyl singles and racking up one of the most impressive resumes in Rap history. From Wu-Tang and Mobb Deep to Biggie and Kool G. Rap, not to mention productions from Erick Sermon, DJ Quik and The Alchemist, his discography reads like a Hip-Hop Hall of Fame. Nothing is off-limits to R.A, his lyricism is one to educate and stimulate the mass crowds. R.A will be hitting up all major cities, including Canberra, Brisbane, Sydney, Perth, Melbourne and Adelaide. Tickets go on sale Thursday 2nd April 2015, check venues for details.